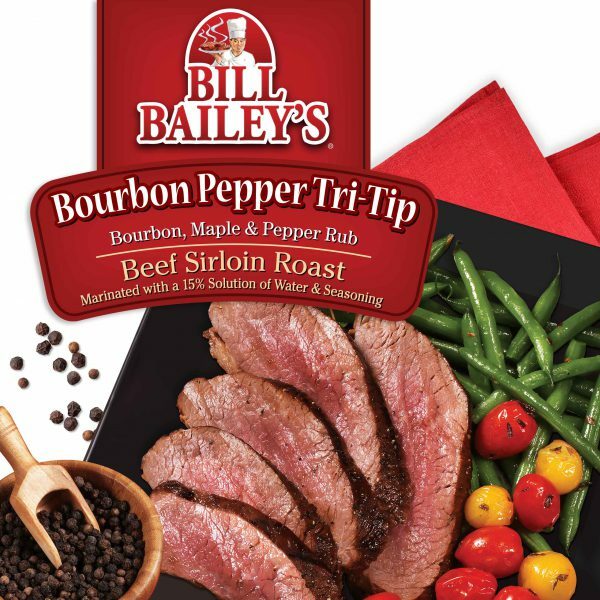 We start with USDA Beef Sirloin Tri-Tip and then add our special marinade featuring layers of sweet with the bite of bourbon whiskey and the zing of black pepper. It’s the makings of a meal you’ll be delighted to serve. Beef Sirloin Tri-Tip, Water, with less than 2% of the following: Maple Sugar, Bourbon Whiskey, Brown Sugar, Spices (including Black Pepper), Molasses, Natural Flavorings, Soy Sauce (Water, Soybeans, Salt, Sugar), Refinery Syrup, Salt, Sugar, Dextrose, Tapioca Starch, Tapioca Maltodextrin, Caramel Color, Gum Arabic, Potassium and Sodium Lactate, Sodium Phosphate. Thank you for taking the guesswork (not to mention hours of time) out of preparing a great tasting, restaurant quality meal. Amazing. Tri-tip gluten free. I am allergic to gluten (celiac). I see your product contains soy sauce which usually is made from wheat unless stated otherwise. Do you use gluten free soy sauce? If your soy sauce is not gluten free, neither is your product. I bought this product at Costco over in Long Beach, Ca. Tasted liked it had through multiple freeze to thaws cycles. In addition to that it was extremely fatty. Don’t buy it. On a more positive note, my dog likes it. So now she is getting fed $6.79 / lb. dog food because this is all it is good for. Thank you for taking the time to let us know about your experience. We take your comments seriously and our Quality Assurance Manager will be contacting you soon. Hopefully, we will deserve an updated review.